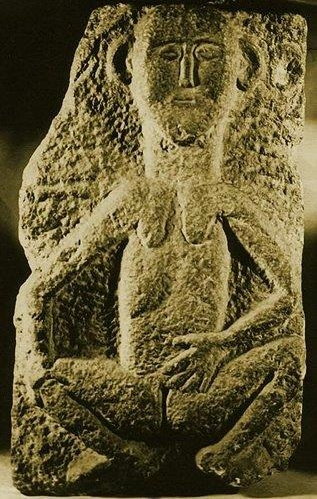 Sheela-na-gig from the Fethard wall in Fethard, Co. Tipperary, Ireland, detail, 12th c.
The work of the nineteenth-century Irish Ordnance Survey marked the coming of the Sheela sculptures into scholarly consciousness and so O’Conor’s remarks are among the earliest recorded reactions to such a sculpture. His comments foreshadow the direction taken by much of the modern scholarship on these images. O’Conor’s words make clear his feeling that such a highly sexualized image had no place on a Christian church; nevertheless, Sheelas often appear on twelfth-century and later medieval churches in both England and Ireland. He is correct that these images cannot be explained by projecting them back into the pagan past, for the appearance of similar imagery on Romanesque churches in France and Spain makes clear that they originated as part of a vocabulary of architectural ornament that was introduced from the continent in the twelfth century. Scholarship has thus focused on finding a way to make the Sheelas fit into their Christian churchly surroundings and has come to see them as warnings against the evils of women and the sins of sexuality: I have critiqued this interpretation of the Sheela sculptures elsewhere.